Navy top, navy bottoms, blue polo shirt. 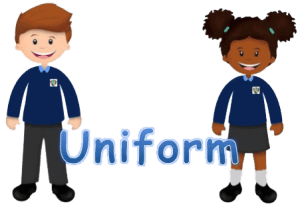 School jumper with crest, Tracksuit and Uniform are available from Kasu Kids, Main Street, Enfield, Ted Murtagh, Haggard St. Trim or Uniform Warehouse, (formerly Head to Toe), beside Tesco Shopping Centre Maynooth. Runners should be worn for PE. Swimming is part of the PE programme and the school tracksuit should be worn if attending swimming.